I know the profound sadness of losing someone you love so dearly and having to continue on without their presence in your life. For many, that pain is almost unbearable and they feel that the only way they will ever find relief is for that loved one to return to this earth or go to Heaven and join them. 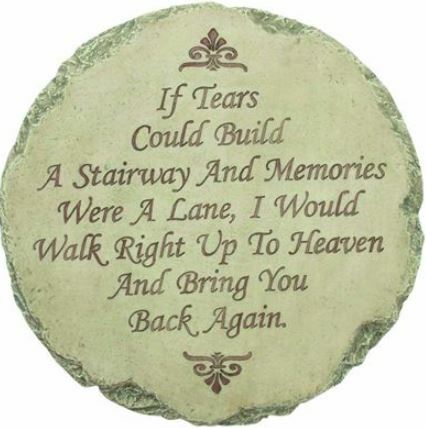 I miss my Daddy and Momma greatly along with my grandparents and several friends that have gone on to be with the Lord. There have been many, many times I have wished they were here for me to share something with them or just be near them. However, I have never wished to bring them back again. My mind is drawn to the precious time while Jesus was on the earth that two sisters, Mary and Martha, were grieved at the loss of their brother, Lazarus. In John 11 it tells us the Mary and Martha sent for Jesus because Lazarus was ill and they wanted Jesus to come and heal him. However, when Jesus arrived in Bethany, Lazarus was dead and buried for four days! Mary and Martha were vexed with Jesus for not coming sooner because they knew if He had come sooner Lazarus may not have died. When they took Jesus to where they had laid Lazarus, in verse 35 it states that, “Jesus wept.” Just those two words…. “Jesus wept!” Did you see that? He wept…for His friend, Lazarus…He, the great I AM, the Creator of the world…our Savior wept. In verses just before that and again after it shares over and over that His spirit groaned within Him. Wow, I know what that groaning feels like! Now, before we jump too far ahead of ourselves and say, “Well, Jesus brought Lazarus back to life, so why doesn’t he bring my husband, brother, friend back to life?” I don’t believe Jesus brought Lazarus back to satisfy the grief Mary and Martha were experiencing. I believe Jesus brought him back to simply given them a reference to what a resurrection is so that they would understand and believe it when He Himself would be resurrected after His crucifixion and death. For if they did not understand what a resurrection is they may have simply believed that Jesus’ body was stolen. Clearly, though, in this passage it also shows that Jesus is certainly aware of and acquainted with our sorrow and grief. He understands our pain when we lose a loved one. With that said, we need to understand that the work the Lord laid out for each of us is completed when He calls us home. There is no unfinished business or even unfinished love. Upon our death, we have served and loved completely and there is nothing more here for us to do. Those of us left behind are the ones who feel the incompleteness and lack…not the saint who has been ushered into the presence of our Holy God. When the Lord does call us home, Scripture tell us that is precious to God. Psalm 116:15 says, “Precious in the sight of the Lord is the death of His saints.” My prayer is that I can find precious and complete what He finds precious and complete and not wish another day of pain, sickness and striving on my loved ones. I do hope this will become your prayer, too. “Oh, that I had wings like a dove! For then I would fly away and be at rest.” Those are the words of King David in Psalm 55:6 and I cannot tell you the times I have felt that exact same way. Clinical depression is an illness that afflicts many people all over the world; and, it is my struggle, as well. Robin Williams’ suicide on August 11, 2014 has caused a great awareness of the deep pain people experience, yet on the outside they seem so jovial, happy and are usually making everyone around them laugh. I think for many who battle severe depression, laughter is a coping mechanism so that they do not have to deal with the pain they are feeling. It is also a window shade, as it were, to hide the darkness and pain from others. I can only imagine the darkness and pain Robin Williams suffered on a daily basis; however, I wish to share my struggle with you in the hope of shedding some understanding of the journey I am walking. My first memory of longing to die was when I was five years old. There was such a profound sense of sadness in me that was uncomfortable and caused me a great deal of physical pain. The longing to die only increased as I grew older and I acted on that longing for the first time when I was 15 years old. I was in the tenth grade and while in school one day, I took an overdose. My teacher found me in the girl’s bathroom and called for an ambulance. That would prove to be the beginning of a lifetime of self-destructive behavior for me. My Daddy and Momma made sure that I would get into counseling, but in their shame my depression and suicide attempt would be hidden from most everyone we knew. The only people who knew that I attempted suicide were my pastor, siblings, one aunt and an uncle. It was hidden from everyone else. The “news” made it around my school, of course, and after a two week absence, I returned to only be met by very cruel comments. One student asked why I was back and said that it was too bad I did not succeed. I wish I could chalk this up to “youth;” however, cruel remarks are thought and said by adults too. After my first suicide attempt, I accepted Christ Jesus as my Savior and began the process of trying to give over to Him my feelings of worthlessness and shame. I prayed, I read Scripture and I sought wise counsel, yet I still struggled with those demons. This only increased my feelings of worthlessness and added doubts that Jesus had truly saved me. Being a born-again Christian does not guarantee that you will no longer have struggles, in fact, it guarantees that the journey will become more difficult in some ways. After all, God showed us in His Word the example of King David…a man after HIS OWN heart. I do not know how you feel about they way God dealt with Paul’s affliction, but it did not set will with me, at first. I understood that God wanted me to be whole in every way; however, I did not understand that He first needed me to be wholly surrendered and wholly His before I could be whole. Now that I do understand, it does not make it any easier for me to deal with my depression but now I realize that there is healing, in many ways, while we sojourn on this earth…but…someday there will be ULTIMATE HEALING. Ultimate healing of the body and the mind because He will give us new bodies…incorruptible bodies…our souls will no longer languish and strive with pain and disability. We will then be like Him! Depression is a cruel and debilitating disease that causes great pain, both emotional and physical. There is something Robin Williams was not told; and I wish someone had reached out to him and held him and told him…THERE IS HOPE…so don’t give up. Some days are long and very difficult to sojourn…when those days come you have to cling to the Rock. If you are having a hard time grasping it, call a friend or your pastor and say, “Help me, please, before I let go.” I implore you not to let go…trust the One who is acquainted with your sorrow for if no one has told you today…THERE IS HOPE. Those who know me well, know that I’m from a place I fondly call: “My Beloved, Virginia.” I miss Virginia so much that at times my heart aches. There are so many things engraved on my soul that I long for each day and miss even more with each day that passes, as I’m away. I miss Virginia when the daffodils tease, as they reach for the sun through the snow begging for Spring to join them in their early blooms. Then as the snow finally melts away and the grass begins to share it’s lovely carpet of green climbing up through the mud left behind by that melting snow — with a promise that life will begin anew — the dogwoods start budding and the cardinals return to build their nests and prepare to raise their young. As Spring marches forward, the hot lazy days of summer come in and families start gathering for reunions to meet the newest members of the family and treasure, once again, time with those who joined years ago. I remember running and playing with cousins who were as close to me as brothers and sisters and all the fun we had playing in the fields and cooling off in the lake at the end of a hot summer day, which never ended without us running through the dark with mason jars collecting fire flies to light our way home. There was always a bottomless glass of iced tea, watermelon picked straight from the garden and Pappaw threatening to chew our ears off, as we squealed with glee, and Mammaw pretending to be worried that he might actually succeed. How I long for one more summer to spend my time between Grandma’s house and Pappaw and Mammaw’s house where I was promised to be spoiled with all the pure, Virginia love that could be given. When the sun set and summer finally gave into the cooler weather of fall, the leaves began to turn every color of red, yellow, umber and finally brown as they let loose of the trees so that we could gather them into what seemed like giant mountains. We would spend hours raking and then what seemed like seconds to enjoy diving, jumping and hiding beneath them. With the final motivation from Momma and Daddy, telling us it was time to clean them up, we raked as hard as we could to the ditch so Daddy could burn them. I remember the smell and the flecks of ash as it floated away with a final “goodbye.” Suddenly, it seemed, as if magically, Thanksgiving would come and oh, how grateful we truly were to grow up in a place that assured us of love. With the smell of the turkey fading away and the fragrance of pine and cinnamon filling the air, Christmas was ushered in to give us the gift of Redemption and Salvation born of a virgin, Mary, found lying in a manger, in a little town so far from a place named after another virgin, Elizabeth, than our little minds could fathom. We bowed are hearts and praised God for those gifts. The snow fell and we found once again we had come full circle in my beloved Virginia. Yes, my home is Virginia and there for me are those precious memories of a haven of love.